The magnesium RBC test checks magnesium RBC blood levels. 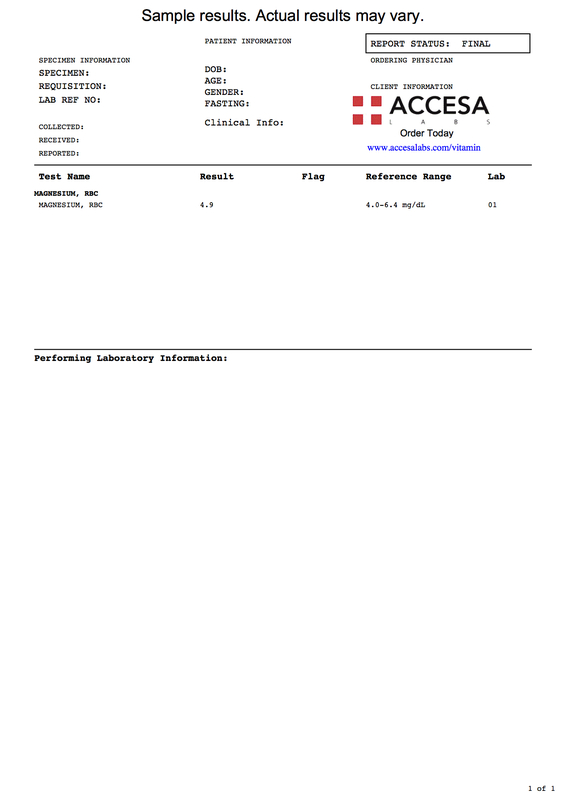 This magnesium RBC lab test is used for intracellular magnesium level testing. What is a magnesium RBC blood test? The magnesium RBC test measures the magnesium RBC blood level. Why is a magnesium RBC test important? The magnesium RBC blood test measures intracellular magnesium stores in the body. This Magnesium RBC Test is a blood test. The magnesium RBC test, also known as a magnesium RBC blood test and an Mg RBC lab test, checks the magnesium RBC blood level. Magnesium RBC measures the level of magnesium in packed red blood cells. Sometimes known as intracellular magnesium, the magnesium RBC lab test is where a lot of magnesium in the body is stored and accessed when magnesium needs are higher in the body. Magnesium is a used in hundreds of chemical reactions in the body and is vital for life. As a result, the magnesium RBC test provides a longer term evaluation (typically 3-4 months) of magnesium stores when compared to the magnesium test. Getting a magnesium RBC test near you should not be an issue as most Quest Diagnostics lab locations carry the necessary equipment to perform the blood test. Once your blood is drawn, your lab results will come back relatively quickly. Your magnesium RBC level will be reported as a number representing the concentration of magnesium RBC in mg/dL. You will then be able to compare your results against the reference range provided by the lab to see if your magnesium RBC level is considered high, low or normal. The magnesium RBC blood test is sometimes ordered with the zinc RBC test for a deeper understanding of intracellular mineral levels. This magnesium intracellular test is a component of the comprehensive mineral panel. Magnesium RBC Test at Guaranteed Prices.